Euronext offers a complete suite of index data products that provide current and historical detailed index composition and weights, index values, divisors and market capitalisation for Euronext indices. The information is provided on a daily or one-off basis. The Euronext Index Weightings product provide detailed index composition and weights, including closing index values for Euronext indices. The Euronext Index Weightings product is comprised of Index (carrying closing index levels, divisors and market capitalisation) and Stock reports (carrying detailed composition data – e.g. number of shares, free float, weighting) published three times a day (two batches of EOD/closing reports and one batch of NXTD/opening reports). The Next Day reports carry data adjusted for corporate actions/dividends/index reviews. For a detailed list of fields available please refer to the Clients specifications. 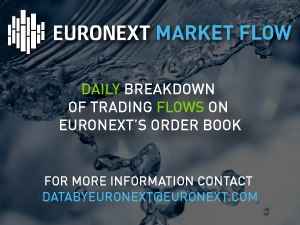 The Euronext Index Membership product provides the full constituent list and identifiers for Euronext indices. Provides reports carrying any corporate actions, divisor changes and dividends paid one day in advance. The product details all the corporate actions to the constituents of the indices including additions, deletions, ex dividend adjustments and changes arising from a variety of corporate events to be applied the next business day. The product also provides reports with upcoming changes & corporate actions impacting the constituents of the indices after the next business day.